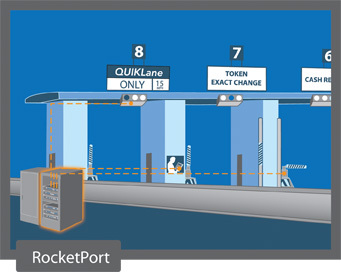 A tolling company in New Jersey was looking for a new way to connect peripheral devices in their toll booths to the main computer at each booth. They needed a serial port card with faster speeds and a large variety of ports available so that each peripheral device could be connected. After evaluating several different port cards, the tolling company found that Comtrol’s RocketPort met all of their needs and specifications. RocketPort connected the receipt printers, coin machines, slot card readers, and fare displays, allowing each connection to exchange information with the main computer. It gave the tolling company versatility by offering numerous serial port options, and flexibility to meet the unique needs of various toll stations. With the industry’s highest throughput across 4 to 128 ports, the RocketPort family of multiport serial cards is unsurpassed in performance. RocketPort offers unmatched data integrity as it maximizes host computer efficiency and minimizes data loss by offering large FIFOs. Delivering up to 921 Kbps transmit-and-receive throughput across all ports simultaneously, high volumes of traffic can flow seamlessly through the toll station. Comtrol’s RocketPort family of serial cards make multiport connectivity more powerful, more reliable, easier-to-use, and more cost-effective than any other controller available on the market today.